I entered an earlier post on the subject of this glue applicator, but got no replies, so I will provide some more info. It is a air pressure powered glue gun that applies PVA adhesive. It is especially nice for times when you have a lot of gluing to do and want to have a neat way of applying it. It is also a nice way of getting glue into an area that would be hard to apply with a regular glue bottle. I have attached a link to a photo to show what it looks like. The assembly in the photo is a 4 inch sched. 40 PVC pipe with a cap at the bottom and a screw cleanout at the top. I tapped the side of the top of the tube for the output of the regulator. The best thing so far to seal the spout is a special bottle, filled with water, made from a ball jar (see photo). It keeps the tube clear of dried glue and you just have to flush out the water by pulling the trigger and waiting for the water to drain (followed by the glue). It takes anywhere from 20 to 40 lbs to force the glue out at a decent pace. I have an aluminum hanger to hold the gun while I am gluing and an aluminum support for the ball jar all clamped with a hose clamp. Although you can't see it, I have a rubber grommet in the top of the ball jar that sort of seals the glue gun barrel when I am not using the gun. The tip of the gun is held in the water in the ball jar. I am hanging the assembly with a simple wire hanger that is attached (along with the regulator) by another hose clamp. I was looking for a simpler way of sealing the tip of the gun to keep the glue from drying, but so far caplugs and other approaches have limited success. Any other improvement ideas would be welcome. When I need to put down a lot of glue, say 48 square feet, I pour it and spread it with a throw away paint roller. Are you spraying for hours at a time? 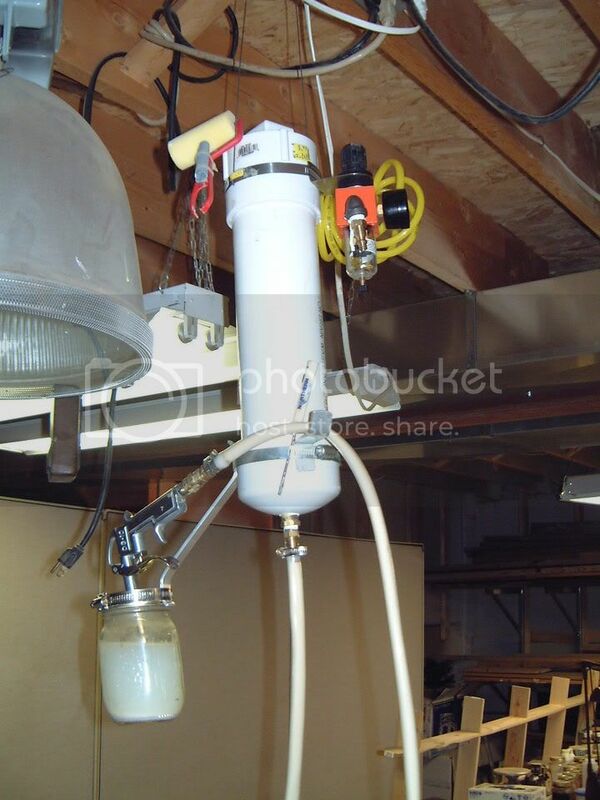 This is a way to put down a very controlled bead of glue with no mess. As far as using a roller to spread it out, here is another photo showing a foam roller that clips onto the end of the spout to roll the glue out. Is that a PVC pipe you are running your air through? I have heard that using PVC with air is not a safe practice as it does not really develop a leak rather it explodes in to shrapnel like pieces. On Thu, 23 Dec 2004 00:35:00 GMT, "Leon"
Same here, or a paint brush for smaller "large" areas. The gun is kind of cool, though. And currently under development: the Delta 69-669 WoodDorkerStopBot with switchable Neander/Normite capability, shipped with starter kit of 1000 Mission style plans. Simply plug in (220 or 110), program for the appropriate woodworking project, go have a beer (wood not included). On Wed, 22 Dec 2004 19:28:57 -0500, "Eric Anderson"
the system of closure used on spray guns should work fine. modifying a cheap detail gun for glue application sounds like some work, but doable. Mmmm. Modifying a small spray gun... Interesting. As far as pressure on PVC. I hear you. The original design was thought to only have to use 5 or 10 PSI. It looks like it typically needs 20 to 40 PSI. I don't think that is a problem based on the fact that PVC pipe is used on water pipes in some cases and they are in the 50 psi area (and I THINK the walls on those types of pipe are thinner). I would like to know what sched. 40, 4 inch pipe is good for. I think I will try to look it up. If anyone knows, please speak up. Believe me, the concern has crossed my mind, but I think I am on solid ground. According to this chart, 4" sch 40 PVC has a working pressure rating of 220 psi. Transport of a compressible gas (air) is far more hazardous than transport of water, because the rapid expansion of the air at failure will indeed send pieces flying. I did a quick search and found a clear warning from a company that is in the business of selling services for PVC pipe. They do not recommend its use for air. If it were me, I'd abandon the idea of PVC for use of any pressurized air application. I wouldn't necessarily go quite that far yet Bob. Typically that mean they recommend against it for pressurized air lines from the compressor. In other words - full working pressure lines that commonly reach above 150psi. I'd look a little further before assuming that this application - Schedule 40 at 40 psi is included in what you read. I'm trying to think of some application that uses Schedule 40 at these pressures on a regular basis, but nothing is coming to mind. Its a judgement call, Mike and I agree its quite conservative. 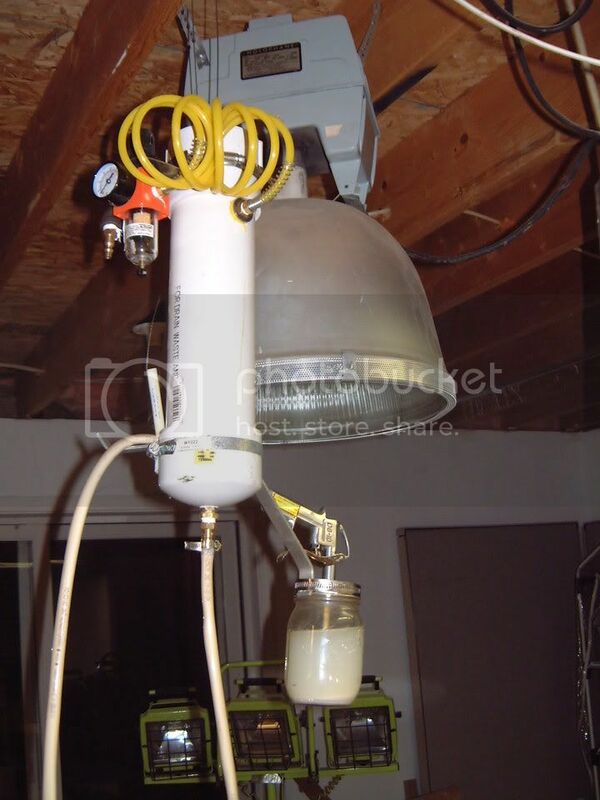 40 psi is the typical pressure for an old fashioned paint sprayer (not HVLP). One of the factors would be how much volume is pressurized (= stored energy) at 40 PSI. He was talking about 4" pipe. That's uncomfortable to me. Another factor is what type of joints are used. I'd be much more comfortable with threaded joints as opposed to glued joints. I haven't seen the glue gun contraption so I don't know how its put together. I think we've had enough comment to allow OP to make his own judgement and I respect your opinion, as well. If it were me, I would reinforce the pipe with some gear clamps around the pipe and spaced every inch or two. These would prevent the pipe expanding when under pressure which could cause fractures to start. If you have a regulator and/or relief I'd not worry too much. Biggest problem w/ PVC is if you hit it it can shatter more easily than metal. I'm sure if you were on a jobsite it would not be approved, however. You could replace that PVC with galvanized steel, threaded caps on both ends. That would eliminate the complaints about pressurized PVC. Suitable paint for garage walls? Adhesive that can securely glue metal, is reversible, and has a fine applicator? Hot glue guns... Recommendations please..